The White House has suspended the credentials of a CNN journalist hours after a testy exchange with US President Donald Trump. Press secretary Sarah Sanders says a reporter’s access was removed because he put “his hands on a young woman”. Mr Acosta, chief White House correspondent for CNN, was called a “rude, terrible person” by Mr Trump at a press conference on Wednesday. A staff member tried to take his microphone during the exchange. 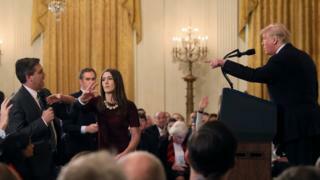 However, Mr Acosta refused to give it up as he attempted to ask the president a further question. Video of the incident quickly appeared online. Mr Acosta called Ms Sanders’ assertion that he placed his hands on the woman “a lie”. What happened at the earlier press conference? 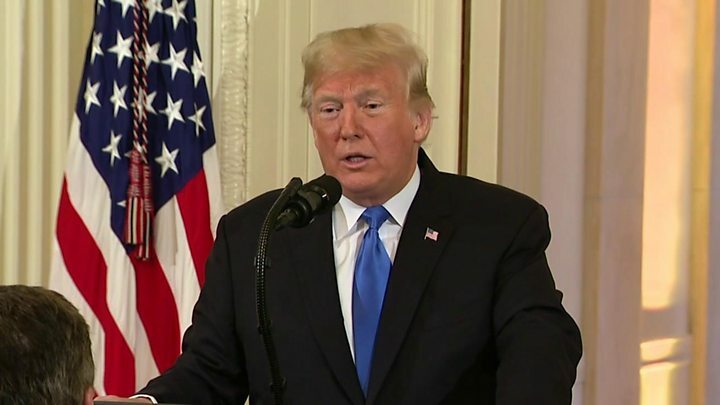 President Trump insulted Mr Acosta after the reporter challenged his recent assertions about a migrant caravan heading to the US from Central America. It was during this exchange the female staff member attempted to take the microphone from Mr Acosta. “That’s enough, that’s enough,” the president said, before telling Mr Acosta to sit down and to put down his microphone.